I'm wrapping up my work on the Weather Channel series Lifeguard! (more on that later this week) and am finally turning my attention to a lengthy laundry list of projects that need some attention, from project pitches to my involvement with this month's BLUE Ocean Film Festival & Conservation Event. But I wanted to take a quick moment to point out an interesting podcast from the UK's Guardian Science Weekly. 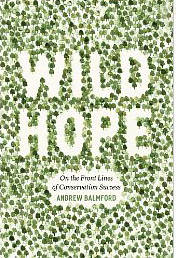 Posted on Monday, the podcast features zoologist Andrew Balmford, author of Wild Hope: On the Front Line of Conservation Success. In his new book, Balmford examines many of the success made in conservation - not to simply, in some Pollyanna fashion, contradict the negative outlook that can manifest itself when you spend any considerable time contemplating the issues of ecosystem decay, endangered species, and global environmental change, but rather to bolster the will and determination to correct them. The threats are real, they are on our doorstep, and now is the time to do something about it. Balmford and his book offer proof that progress is being made. Give a listen (click here to listen to the podcast) and check out Wild Hope: On the Front Line of Conservation Success if you are feeling a bit overwhelmed. I plan to.